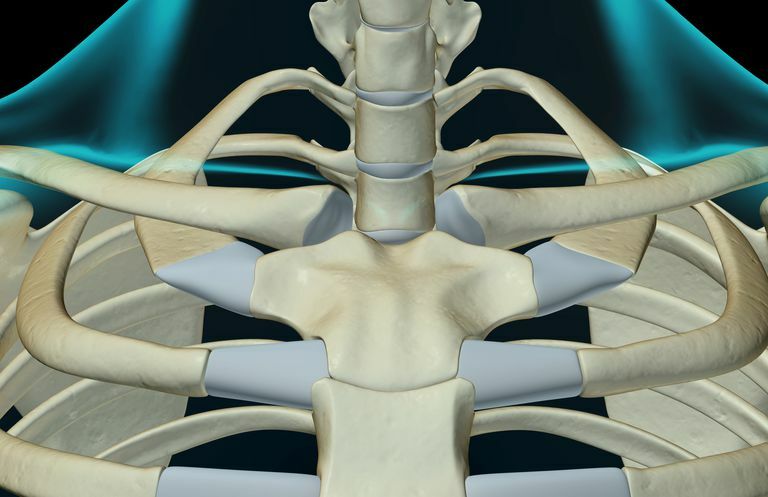 The sternoclavicular joint, or SC joint, is the connection of the sternum (breastbone) to the clavicle (collarbone). This SC joint is uncommonly injured, but it can be problematic when an injury is sustained. The sternoclavicular joint can dislocate from its normal position. The clavicle will either dislocate in front (an anterior SC dislocation) or behind (a posterior SC dislocation) the sternum. The posterior SC dislocations are more worrisome because of the important structures that are located just behind the sternum. These structures include major blood vessels and the trachea (windpipe). Damage to these can cause life-threatening problems with blood flow and breathing. Dislocations of the SC joint are usually the result of an injury to the shoulder. Most commonly, the outside/front of the shoulder is struck forcefully, and an anterior SC dislocation occurs. In some cases, a blunt force directly to the front of the chest can cause a posterior SC dislocation. An SC injury can be difficult to see on a regular x-ray, although there are ways to visualize the SC joint by changing the way the x-ray is performed. If the SC joint appears to be injured, a CAT scan is often performed to better evaluate the type of dislocation. Symptoms of an SC dislocation depend on whether or not it is an anterior or posterior dislocation. In the case of an anterior SC dislocation, you can usually see the dislocated end of the clavicle. Patients have pain and swelling in this area. Patients with a posterior SC joint dislocation may have a subtle dimpling of the skin over the SC joint, as well as pain and swelling. In addition, patients can have difficulty breathing, painful swallowing, and abnormal pulses caused by compression of the trachea, esophagus, and blood vessels. Minor sprains to the SC joint are treated with a sling and anti-inflammatory medications. When the SC joint is completely dislocated, a repositioning (called a reduction of the joint) of the SC joint can be attempted by sedating the patient and pulling gently on the arm. This may allow the SC joint to 'pop' back into position. The SC joint does not necessarily need to be perfectly repositioned to have a good long-term result. Surgery to relocate the SC joint is considered for posterior SC dislocations, and some painful, symptomatic anterior SC dislocations. If non-surgical repositioning of the joint is not successful, then surgery may be done to relocate the SC joint and repair the damaged SC joint ligaments. When surgery is performed for a posterior SC dislocation, the procedure is done with both an orthopedic and a vascular surgeon available. The reason is that there is a chance of damage to the major blood vessels of the chest, and a vascular surgeon must be immediately available if needed. In any patient younger than 25 years old, a growth plate fracture of the clavicle should be suspected rather than an SC joint dislocation. The medial clavicular growth plate is the last growth plate to close in the body. It is this growth plate that is injured, rather than the SC joint, in most patients under the age of 25. The treatment of a medial clavicular growth plate fracture is similar to the treatment of an SC dislocation, except that it is very rare for these young patients to require surgery. Medvecky MJ, Zuckerman JD. "Sternoclavicular joint injuries and disorders" Instr Course Lect. 2000;49:397-406.